I'm new here* and just getting a grasp on the capabilities of GIMX. I did a search and saw a few older threads about Rock Band compatibility. I know it's currently listed in the incompatible list. 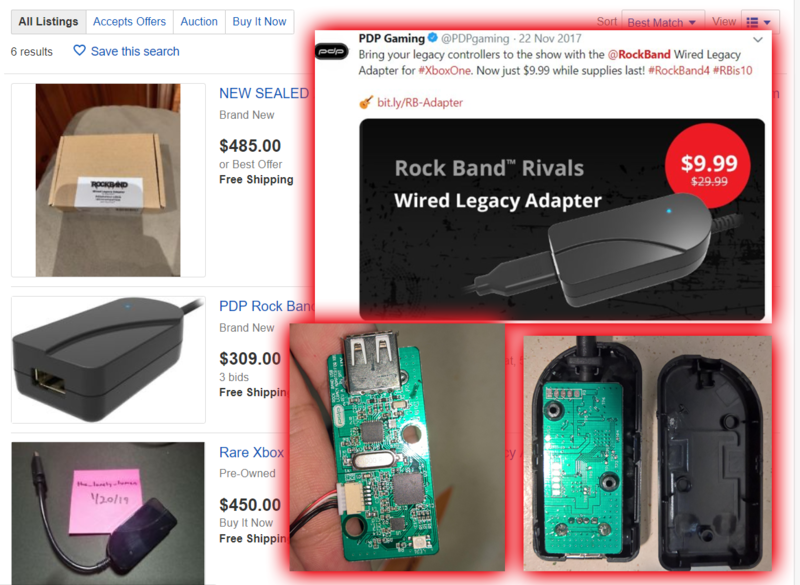 A while back Harmonix (RB developer) worked with PDP (officially licensed peripheral company) to produce a limited run of a Legacy Peripheral Adapter that let people used their Xbox 360 wired peripherals on Rock Band 4 for Xbox One. For some reason despite there still being a large demand they decided to discontinue the adapter. Some conjecture it's because they had a falling out with Harmonix. Others that the licensing/auth costs associated with making devices for Xbox One made the product unprofitable. To this day people are still trying to find these devices for reasonable prices. Of course people have taken advantage and bought multiple listing them for as much as $500 on ebay (MSRP was $29.999 and dropped to $9.99 at points). A few people discussed reverse engineering the PDP adapter but nothing much came of it. Specifically for drums there's quite a few people that bought nice Electronic Drum kits just to play. Now they're left without a way to play the newest game. A lot of us have put hundreds or more into our music libraries. Some people have even bought PS4s and abandoned their non-transferable song library to keep playing. I have a PDP Legacy adapter and decided to look into see if there was a reasonable alternative to the adapter. That's why I'm here. I think quite a few people would gladly pick up GIMX adapters DIY or from the shop if it helped them. I've done a little bit of work to figure out what the PDP device is doing. I hooked them up to my PC and sniffed the USB messages when hitting buttons and drums. Similar to GIMX it takes the poll response from the Xbox 360 peripherals and changes it to what Rock Band on the Xbox One expects. tttt is the rest of the buttons and used the following button mask. So as seen in the image Rock Band on both systems seems to encode the different drum hits to a combination of controller buttons along with the left and right thumbstick angle. So it seems possible to map this and passthrough the data. I'm not sure what or if the first 8 or so bytes of the Xbox One reports represent. Wondering if it might be possible to use GIMX for this with Drums at first at least. If not would anyone have any recommendations to accomplish this with something more custom. I recommend to capture communication between the adapter and the console. Then see if there are unexpected thing happening. If you see strange transfers with data looking random between captures, then there is probably some authentication involved. Thank you. I'll look into this! I'm not sure I have the hardware on hand to get it down right away. But will update if when I'm able to. Not sure if the Device Info reported to Windows is of importance. But here it is. I can also get the initialization/handshake between the devices and windows in the mean time. SrgntBallistic, thank you for starting this. I am one of those people seeking the wired PDP adapter, or an affordable alternative. I've ordered a GIMX adapter. I have the ION Drum rocker and a few Linux PCs including a Pi3. If I can assist without the wired PDP legacy adapter, I'll try my best. hey thanks for looking into this. i will stay posted to this thread, maybe in the future i might be able to add some insight but right now i'm still learning. Just saw this..sick!! Off topic for the thread but this is potentially useful for lots of interesting stuff. Bookmarked! Ooh, here’s something I’m in a good position to help with. I have a GIMX, the full setup for e-drums on RB4 X1 (PDP adapter, MadCatz MIDI Pro adapter, ekit) and a wireless RB3 kit with MadCatz X1 adapter to compare against, if necessary. I may even be able to dual-proxy to capture the input and output of the PDP adapter, using multiple GIMXs. I know that the analog data is used to encode velocity information, while the different pads mapped to the same colour are handled by a combination of buttons. If anyone has any requests for tests to perform, let me know and I’ll see what I can produce. I’m seeing two different parts to implementing this into GIMX; the ability to output PDP-esque data to the X1, based on the data transmitted in via the MadCatz MIDI adapter; and further down the line, the possibility of being able to map MIDI data to controller outputs. This would eliminate the requirement for a MIDI adapter, which are also increasingly rare. OK, I’ve just been doing some reading on this, and the differences between the 360 and X1 controller packet formats. The PDP adapter does only a few things to the 360 packet; it adds a header to it, calculates some bytes based on input, and sends it on. Guesses based on info from https://vestigl.com/packetformat/packet ... l#From0x20 and https://raw.githubusercontent.com/torva ... ick/xpad.c. It is likely that the game ignores this content, however it is included for the purposes of navigating the dashboard.